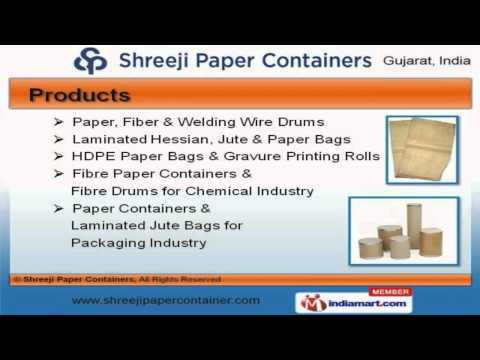 Welcome to Shreeji Paper Containers, Manufacturer and Supplier of Fiber, Paper Drums, Laminated and Jute Bags. The company was incepted in 1996 at Ahmedabad. We serve to Food, Chemical, Pesticide and other industries. Superior quality products, Cutting edge technology and competitive pricing policy are the plus points of our organization. We offer a wide assortment of Welding Wire Drums, HDPE Paper Bags and Gravure Printing Rolls. Paper, Fiber and Welding Wire Drums offered by us are widely acclaimed in the market. Our Laminated Hessian, Jute and Paper Bags are available at industry leading prices. Our clients can avail from us an exquisite range of HDPE Paper Bags and Gravure Printing Rolls that are cost effective. Fibre Paper Containers and Fibre Drums for Chemical Industry are setting a benchmark in the market. Our Paper Containers and Laminated Jute Bags for Packaging Industry are one of the best in the market.